Prince Khurram, who would become Shah Jahan, was born in India in the same month as the Prophet Mohammed in the auspicious year 1,000 of the Islamic calendar (January 15, 1592). He was named Khurram, which means "joyous," by his doting grandfather Akbar, who said the birth made the world glad. "He was born during the height of Akbar's power," says art historian Shobita Punja, "when most of India came under Mughal rule. He was very well educated, had brilliant teachers, and was quite an aesthete. He really was a very cultured human being." Though court poets celebrated the young girl's beauty, no contemporary likenesses of her are known to exist. According to author and art historian Milo Beach, "There are paintings that are labeled 'Mumtaz Mahal,' but they are simply generalized depictions of a Mughal beauty. There's virtually no contemporary account of her, because none of the historians would have had contact with her." Under Mohammed's law of "purdah," the law of the veil, women were obliged to hide their faces from public view. The only women depicted in paintings were court dancers and entertainers; it was taboo to paint royal women. "Royal women were kept in seclusion, but that has nothing to do with the power they held," adds Beach. "They clearly were extremely powerful. Shah Jahan's father, Jahangir, married a woman named Nur Jahan who was really the person who ran the empire for the second half of Jahangir's reign, when he became addicted to opium and alcohol. He barely functioned as an emperor, and she ran the country." "We know very little about Mumtaz Mahal except that she was the daughter of Asaf Khan, who was the Prime Minister for Shah Jahan and son of the Prime Minister for Jahangir whose sister, Nur Jahan, married Jahangir. You cannot be more closely related to the Imperial family than that. Many of Asaf Khan's cousins and other relatives were also placed in positions of enormous power in the Mughal court. 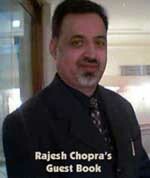 So Mumtaz Mahal probably had a very important and influential role in her husband's life." Before marriage to Mumtaz Mahal, the Emperor Jahangir had arranged two other marriages for his son for political purposes. But although Shah Jahan had three regular wives, Mumtaz Mahal became his favorite and bore his only children. The Prince would not part with her even on his numerous military campaigns. In his suffering, she sustained him; in his glory, she inspired him to acts of charity and benevolence. Both comrade and counselor, she was beloved by him for her unswerving loyalty and by his people for her wise and compassionate guidance. 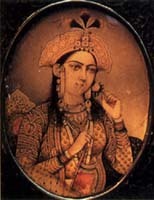 Marriage - Married Arjumand Bano (Mumtaz Mahal) in 1612. She died in 1631, giving birth to his 14th children. Agra, once the capital of the Mughal Empire during the 16th and early 18th centuries, is two and a half hours by express train from New Delhi. Tourists from all over the world visit Agra not only to see the ruins of the red sandstone fortress built by the Mughal emperors but to make a pilgrimage to Taj Mahal, India's most famous architectural wonder. 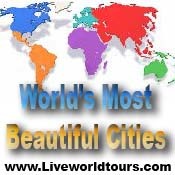 In a land where magnificent temples and edifices abound to remind visitors about the rich civilization of a country that is slowly but surely lifting itself into an industrialized society. The postcard picture of Taj Mahal falls short to convey the legend, the poetry and the romance that shroud what Rabindranath Tagore calls "a teardrop on the cheek of time". 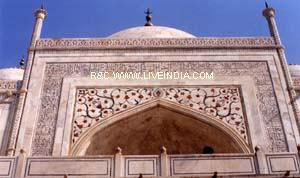 Taj Mahal means "Crown Palace" and is in fact the most well preserved and architecturally beautiful tomb in the world. It is best described by an English poet, Sir Edwin Arnold, as "Not a piece of architecture, as other buildings are, but a proud passion of an emperors love wrought in living stones." It is a celebration of woman's love, exquisitely potrayed in marble. And that's the way to appreciate it ! Taj Mahal stands on the bank of River Yamuna, which otherwise serves as a wide moat defending the Great Red Fort of Agra, the centre of the Mughal empire until they moved their capital to Delhi in 1637. It was built by the fifth Mughal emperor, Shah Jahan in 1631 in the memory of his second wife, Mumtaz Mahal, a Muslim Persian princess. She died while accompanying her husband in Behrampur in a campaign to crush a rebellion, after giving birth to their 14th child. Her death so crushed the emperor that all his hair and beard were said to have grown snow white in a few months. When Mumtaz Mahal was still alive, she extracted four promises from the emperor: first, that he build the Taj; second, that he should marry again; third, that he be kind to their children; and fourth, that he visit the tomb on her death anniversary. He kept the first and second promises. Construction began in 1631 and was completed in 22 years. Twenty thousand people were deployed to work on it. It was designed by the Iranian architect Istad Usa and it is best appreciated when the architecture and its adornments are linked to the passion that inspired it. It is a "symbol of eternal love"
Having buried her down at Behrampur, it was time for the emperor to keep his promise and build a tomb there itself. But by and by , it was felt that it was virtually impossible to transfer all the marble there, as it would cost an entire fortune and an entire lifetime. So, when Agra was chosen as the only alternative, astonishingly her grave was uprooted and brought to Agra, only to be finally transferred to the monument, completed twenty two years later. The Taj rises on a high red sandstone base topped by a huge white marble terrace on which rests the famous dome flanked by four tapering minarets. Within the dome lies the jewel inlaid cenotaph of the queen. 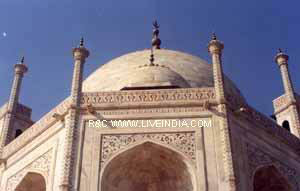 So exquisite is the workmanship that the Taj has been described as " designed by giants and finished by jewellers". The only asymmetrical object in the Taj is the casket of the emperor which was built beside the queens, as an afterthought. 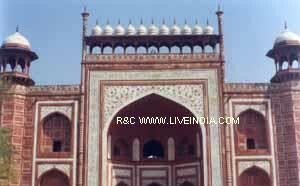 The emperor was deposed by his son and imprisoned in the Great Red Fort for eight years but was later buried in the Taj. 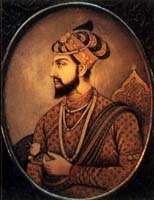 During his imprisonment he was barred from visiting Taj. What he could have was just a little view of Taj in a reflection of a diamond. As a tribute to a beautiful woman and as a monument for enduring love, the Taj reveals its subtleties when one visits it without being in a hurry. 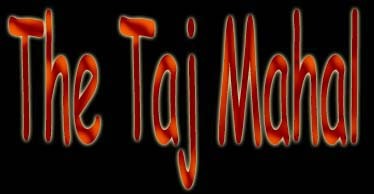 The rectangular base of Taj is in itself symbolic of the different sides from which to view a beautiful woman. The main gate is like a veil to a woman's face which should be lifted delicately, gently and without haste on the wedding night. In indian tradition the veil is lifted gently to reveal the beauty of the bride. 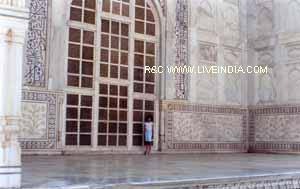 As one stands inside the main gate of Taj, his eyes are directed to an arch which frames the Taj. The dome is made of white marble, but the tomb is set against an awesome backdrop of the river and it is this background that works its magic of colours through their reflection and transforms the view of the Taj. The colours change at different hours of the day and during different seasons. 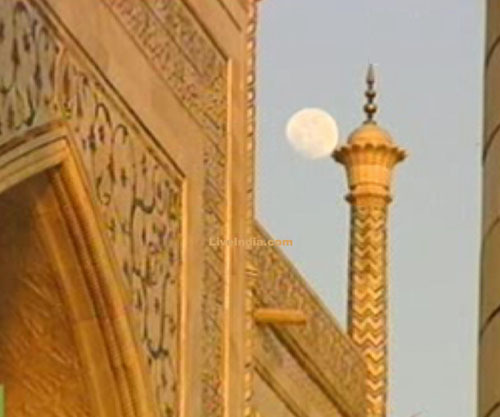 Like a jewel, the Taj sparkles in moonlight when the semi-precious stones inlaid into the white marble on the main mausoleum catch the glow of the moon. 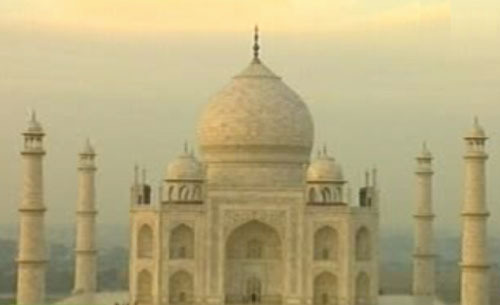 The Taj is pinkish in the morning, milky white in the evening and golden when the moon shines. These changes, they say, depict the different moods of woman. It may be a monument to love, but the Taj has seen its share of trials and tribulations. Taj Mahal is located in the city of Agra, one of the most powerful cities in the medieval world. 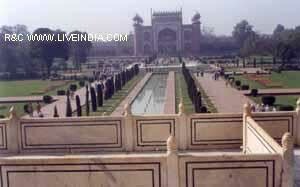 Agra is a part of the state of Uttar Pradesh, in the northern region of India. 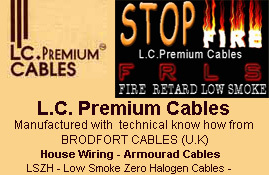 It is a part of the great northern plains and is situated on the west bank of river the Yamuna. Agra is 204 km south of Delhi.